I've used V4.x of Audiolabel for 2 or 3 years to print paper labels, so I didn't think it would be much of an issue to upgrade to 5.0 and print directly on CDs with my Canon PRO100 printer. I've used Canon's "Image Garden" to print directly on discs, and this works fine although the program is rather poor and without many features. That said, I can't get AudioLabel to print a centered image; the result shows that the image is offset to the right and down by a significant distance. I double checked all of the printer controls to ensure that the CD tray was being used etc, and I don't think there's an issue there. I see that I can manually adjust the offset in AudioLabel and probably could get it centered by trial and error, but really? I'm looking for a bit of help to correct this problem. ******* 07/10/2015 Please Note: AudioLanbel version 6.0 now includes the template for the Canon Pro-100, so there is no need to make a custom template. 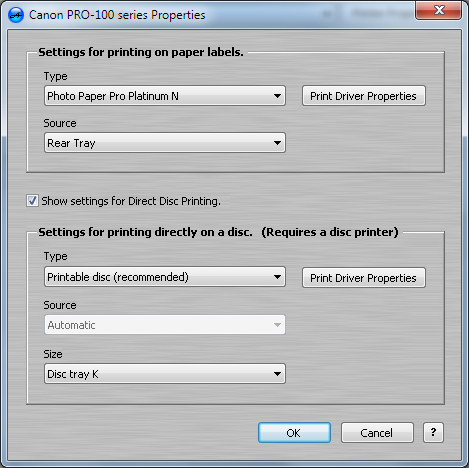 The print drvier settings shown below are still required to print directly on the disc. 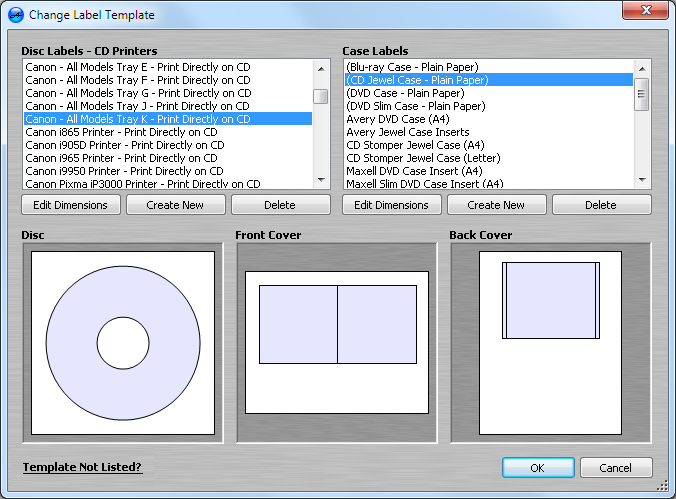 When printing directly on the disc, AudioLabel centers the printed image based on the template selected in Change Label Template dialog (shown below). All of the Canon disc printers have a plastic tray for loading inkjet printable discs into the printer. Each Canon disc tray has a letter marked on it (letters A-K) that corresponds to a specific template in AudioLabel. 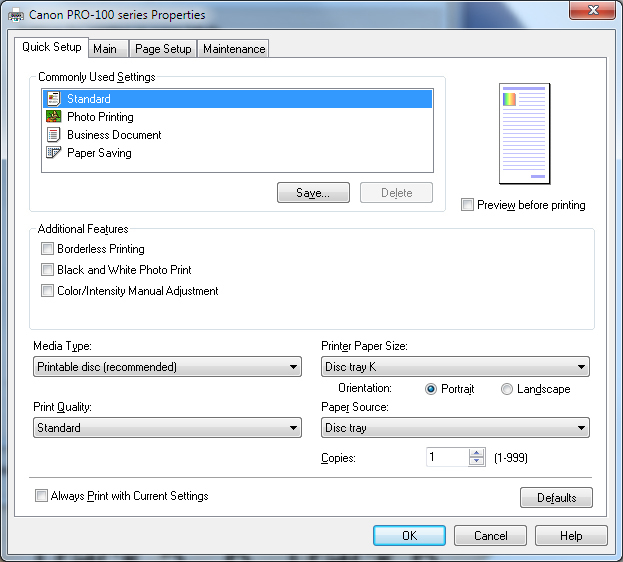 The Canon Pixma Pro 100 uses Tray Type K. You can also select the "Canon Pixma Pro-100 Printer" template from the list below. 1. Start AudioLabel and open the Change Label Template dialog (shown above). 2. Click the Create New button under "Disc Labels" to open the Edit Dimensions dialog (shown below). 3. Please enter the following information in Edit Dimensions dialog and click the Save button. **Please note the Inner Diameter will need to be adjusted for the center hole size of your inkjet printable disc. I appreciate your help, and will give it a try. Just a quick note to say this worked fine. Thanks for the help. Glad to hear it. Hopefully this will help out other folks with the Canon Pixma Pro 100. I'm noticing a slight 'overspray' along the edges of the CD (maybe 1mm). I thought I could eliminate this by lower the CD width parameter by 2 mm from what was used in the original Pro-100 printer file you provided, but the problem continues. Do you have suggestions on how to keep the ink only on the CD and prevent the overspray. To get exact print alignment (with no ink overspray) you will need to measure the dimensions of the ink jet printable disc. Each brand/model of ink jet printable disc has a different printable area (the surface coating where the printer can apply ink). What is the outer diameter and inner diameter of the surface coating of your ink jet printable disc? I'm using Taiyo Yuden / JVC discs, bulk packaged. Their printable area is nearly the entire disc surface; my ruler measures the outer diameter of the printable area as 118 mm and the inner diameter at 24. BTW, when I say "overspray" I mean that the ink is spray beyond the edge of the CD and onto the Disc K holder. This results in ink getting sprayed on the printer rollers as well, and has ruined a few prints I made after printing a CD. I'd be happy with printing 95% of the area of the CD rather than 100% if that removed the chance of ink overspray. 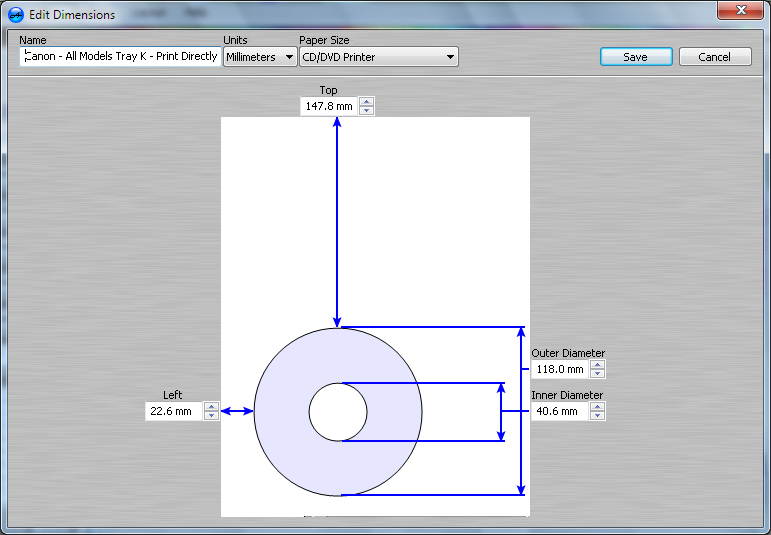 To get no "overspray", you can edit the dimensions of the "Canon Pixma Pro-100 Printer" template in the "Change Label Template" dialog of AudioLabel. When you change the "Outer Diameter" dimension, the "Left" and "Top" dimensions also have to change. Here's a list of different template dimensions for less overspray. Notice that for every 2 mm subtracted from the "Outer Diameter", you need to add 1 mm to the "Left" and "Top" dimensions. Also, for this to work properly the "Background Overlap" option in the "Print Dialog" needs to be set to zero.